Living in New York, I’ve learned that maximizing the space in my apartment is key to living comfortably. I’ve realized that the more purposes a single piece of furniture can serve, the better. Like a lamp with built in shelves or a multi-level table for extra storage space. The great thing about dual-purpose furniture is that it inspires some serious creativity. Designers have to think critically about the practicality of the product and how the purposes of the product relate. The product combination should make sense to the customer and should make their lives easier in some way. For instance, a combination-wine-and-spice-rack might not make very much sense because wine and spices don’t have much to do with each other (at least to my knowledge, which I admit is limited when it comes to both wine and spices). Just because wine and spices both need homes doesn’t mean they should “live” together. However, a combination wine and glass rack would be ideal – one location for two related products. 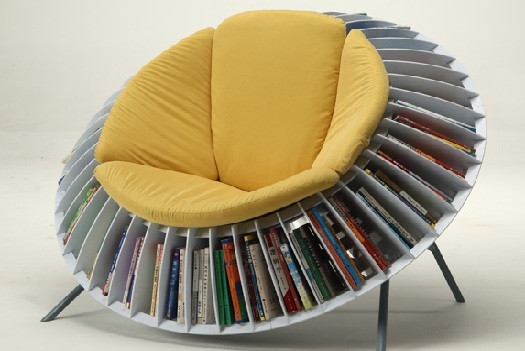 When I came across the Sunflower chair with a built-in bookcase designed by He Mu and Zhang Quian from the Shanghai University of Engineering Science, I saw the value immediately. A comfy chair surrounded by an assortment of books at arms length that has the utility any bookworm would love and the visual appeal to charm any designer. The book storage-chair combination eliminates the need for a separate bookcase, freeing up those precious square feet in a living space. Although the Sunflower chair isn’t for sale, its ingenuity has not gone unnoticed. The design won the Redtory Design Award at the Design for Sitting Grand Prix competition in Guangzhou, China. The day this chair goes to market is a win for all small apartment dwellers. Out with the bookcases and in with the Sunflowers!